ZIF MODULE ZIF5028 is a 6 channel Z-Wave controlled DIN mountable module. The module is equipped with 6 relay switches and 6 digital inputs for mounting on a standard M36 DIN rail (EN50022). ZIF5028 is a 6 channel Z-Wave controlled DIN mountable module. The module is equipped with 6 relay switches and 6 digital inputs for mounting on a standard M36 DIN rail (EN50022). The 6 independent relay switches can freely be controlled from the Z-Wave network and be used for many different purposes. Furthermore, the relay switches are able to be directly controlled by the 6 digital inputs. The 6 digital inputs can be connected to dry contacts, e.g. limit switches, door/window contacts, push-buttons. Or they can be connected to open-collector outputs from discrete sensors, e.g. PIR sensors, etc. ZIF5028 can be used for controlling AC and/or DC loads. Each relay switch are rated for loads of up to a maximum of 16A. All 6 relay switches are galvanically isolated from each other. The 6 inputs in ZIF5028 is able to function as a scene controller and activate predefined scenes in other Z-Wave devices or controllers (by transmitting Central Scene notifications). ZIF5028 must be supplied from a 10 – 24Vdc power supply. Initiation of Z-Wave inclusion and exclusion is fulfilled by activation a push-button through a little hole in the front of the module. 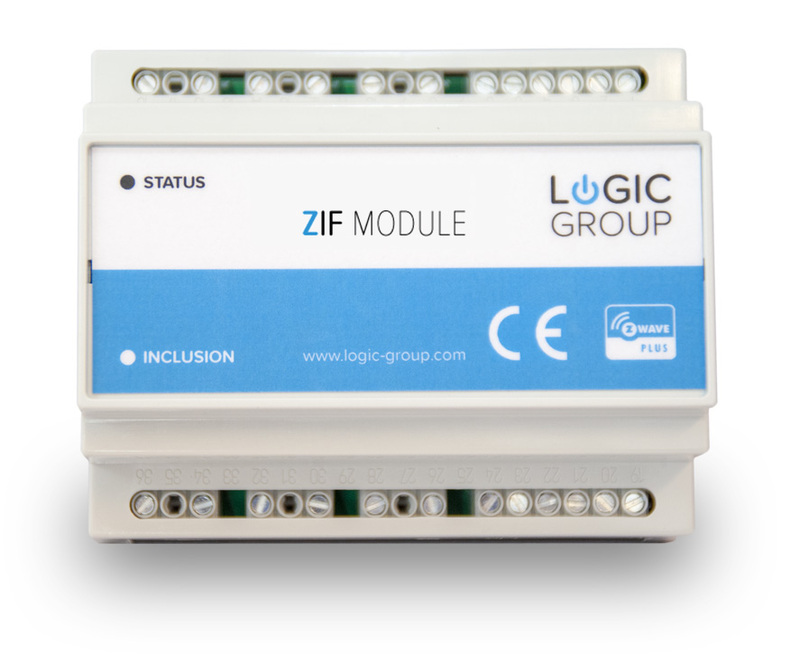 ZIF5028 is equipped with a LED in the front of the module for different kinds of status indications.